Hollyhocks evoke within me a deep nostalgia for the balmy sunlit winter gardens of my childhood in northern India. Their spires enclosed a sequestered nook, towering protectively over the riot of color provided by larkspur and cosmos, salvia and cineraria, pansies, nasturtiums and candytuft in their orderly flowerbeds. Long, lazy afternoons were spent reading or playing scrabble while the dogs chased each other on the grass. 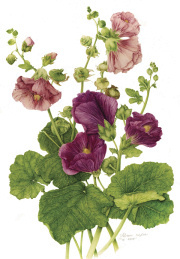 Hollyhocks originated in China and traveled west along ancient trade routes via India to the eastern Mediterranean. The Romans brought them to Britain as did returning Crusaders from the Holy Land. Elizabethan England saw hollyhocks flourishing in country gardens, shielding unsightly views by providing a decorative border. In the United States the colonists of New England were the first to grow hollyhocks which soon became popular from Maine to Georgia—Thomas Jefferson grew them at Monticello; Childe Hassam, the 19th century American Impressionist immortalized them in his painting. There are nearly 60 species in the genus Alcea of the mallow family, Malvaceae. Their common name, Hollyhock, derives from the many holy or blessed healing powers of the hock (or mallow plant). The official Latin name, Alcea rosea, has its origin in the Greek altho which means to cure or heal. Malake, the family name means soft—resulting in healing with softening. Hollyhocks were considered to be antiinflammatory, astringent, demulcent, diuretic, emollient, febrifuge, and hence able to cure a host of ailments. Poultices were applied to chilblains; they were used to prevent inflammation, bedwetting and bleeding gums. In ancient China hollyhocks served as ornamental features in the gardens of the wealthy, while providing peasants with edible greens. Flower buds were deemed a delicacy while the slimy juices eased coughs and insect bites. In Europe the fresh or dried leaves were strewn over straw-covered floors to control flea and bug infestations by both the rich and poor. Paper was made from their fibrous stems and dyes obtained from dried flower petals. Imagine the long journey hollyhocks have made, covering centuries and continents, only to become a mainstay in our cottage gardens!